Time for the second challenge at http://trimmiescraftchallenge.blogspot.com/. This week the challenge is 'moving components', so anything which is sliding or swinging. I'm looking forward to your creations. Here is mine. 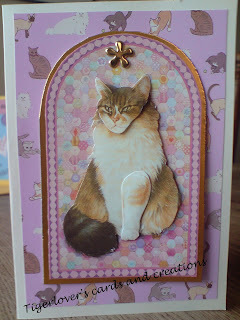 A birthday card for a cat loving friend with a hidden message behind the cat image. This has been put together with a little help from my mum. I hope you like it. Thank you all for looking, your comments are very welcome. This is beautiful. I love to see young work. Yours is wonderful so I am becoming a follower. I'm sure your friend will love it - great cat!